Baking blind is necessary for some pastry dishes, especially flan cases and individual tartlets. The process of blind baking involves baking the pastry case before the addition of any filling, to make sure the base of the pie remains crisp. This is especially relevant when using a chilled filling or one that requires less cooking time than the pastry crust. Blind baking helps to prevent the disappointment of serving soggy, undercooked pastry bases that can cause otherwise perfect homemade quiches, flans and tarts, to fall apart. Some cooks recommend that the bottom of these pastries are pricked with a fork before baking blind-not something I do because the filling can seep through the holes. 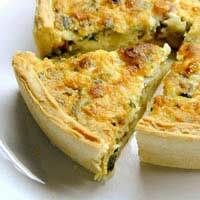 Make the short crust pastry as described. When it is ready to use, line an 8inch flan tin with the pastry and prepare it for baking blind by lining the pastry case with greaseproof paper or foil, cut to shape. To prevent the centre of the pastry case from rising up, weigh it down by placing dried beans or rice grains in the paper or foil lining. If you plan to make quiches and tarts regularly, it is worth investing in some special ceramic ‘baking beans’ from a kitchen shop. The pastry case is now ready to be baked blind. Just pop it into a preheated oven (190-200C) for about 10 minutes. The case should turn a sandy colour during this time. Remove the pastry case from the oven and take out the paper or foil lining with the ‘weights’ inside and return the pastry case, still in the tin, to the oven for another 2-3 minutes. Remove from the oven and leave to cool. Cover the bottom of the pastry case with a thick layer of mustard, sprinkle the grated cheese on top of the mustard, then place the tomato slices around the edge. Beat the eggs and cream together and pour this mixture over the other ingredients in the tart. Bake the mustard tart for 30 minutes at a slightly cooler temperature of 130C. Serve straight from the oven or eat it cold. Prepare the short crust pastry and roll it out to line a 7inch flan tin. Using greaseproof paper or foil again, cut to shape, line the pastry with this and weigh it down with baking beans. Bake in a preheated oven (200C) for about 10-15 minutes. Meanwhile, fry the onions in butter to soften them. In a bowl, mix together the cottage cheese, salt and pepper and the beaten eggs. When it is time to take out the flan case, do so, remove the paper/foil and beans. Place a layer of the lightly fried onions in the bottom of the pastry case, then pour over the egg and cheese mixture. Decorate the top with tomato slices and bake at 170c for about 30 minutes. Check that the centre of the tart is firm. There are so many fillings that can be used with the baking blind method, but it is always fun to invent your own! Try cauliflower (450g) florets cooked in boiling water for 4-5 minutes, drained and cooled then mixed with lightly fried onions, to which you add 2 tablespoons of plain flour to make a roux and 200ml milk to make an onion sauce. Add this together with 125g crumbled blue stilton and 25g grated cheddar. Crumble the stilton over the base of the previously baked blind pastry case, put the par-boiled cauliflower florets on top, then cover with the onion sauce and sprinkle with grated cheddar. Bake as before in an oven preheated to 190C for about 30 minutes. Bake blind as before and mix your chosen ingredients with eggs and milk/cream/cheese sauce/canned tomatoes, whatever you fancy trying. As long as there is sufficient liquid or sauce to cover the ingredients and set firmly, and the pastry case has been sufficiently prepared, the quiches or tarts you make should turn out well. Enjoy experimenting!